The plot is hard work to follow and not as satisfying as it might have been, but it looks incredible. Apparently Studio SHAFT is famous for anime like that, but nothing I've seen before from them has been this psychedelic (Dance in the Vampire Bund, Dual! Parallel Trouble Adventure, Tsukuyomi Moon Phase). The story is... well, let me give you a flavour. Episode 1 has Shintaro (the shut-in) and Eme (the girl in his computer) going outdoors for the first time in two years and getting involved in a terrorist incident. Eme's quite funny. Episode 2 has nothing to do with any of that and indeed is set before episode 1. It's about a schoolgirl called Momo who's an idol (i.e. celebrity and pop star) due to her supernatural attention-magnet powers, which she doesn't want and is causing considerable disruption to her life. She also meets a rude small boy who needs kicking. Episode 3 introduces us to a group of teenage superheroes and ends up retelling episode 1 from their point of view. They're called Mekakushi Dan (the Blindfold Gang), although they're an informal, disorganised group of amateurs who don't even seem to have a firm grip on what their powers are and what it might all mean. Episode 4 has the rude boy in a dream sequence reality loop, with the choosing of death and yet again almost all-new characters. It goes on like that. There's no main character. It's too fractured even to be called an ensemble, if you ask me. I'm tempted to reorder the episodes into chronological order, just out of curiosity, but I'm afraid I wasn't sufficiently impressed with the series to be tempted to rewatch it. I found it interesting, but it didn't hook me. That said, if you straightened it out, I think this series would have a sound plot. There's a bad person. There's suicide, from more than one major character, although to describe it like that is an oversimplification. (That suicide gave the show its emotional core, for me, and is what kept it human.) There are also some entertaining and/or funny characters, such as Eme and to a lesser extent Momo. There are other characters I'm tempted to call underdeveloped, but on reflection I think it's more a case of them not coming across clearly enough through the story's fractured presentation. Maybe they'd seem fine if you rearranged the show in chronological order? It's very possible. However in the show as it stands, one might feel that one hasn't got to know (or indeed recognise) everyone as well as one might like. It's part of a multi-media project called the Kagerou Project. For the purposes of my review of this anime, I don't think that matters... but it's worth mentioning because there are people out there who see this as essentially an adaptation of a game and hence a simplification of much more complicated material. Other people say that it's actually an adaptation of a song series. No, really. That said, though, I can sort of imagine it. Many of these episodes are almost anthology-style stories that fit together not in a progression but in a sort of mosaic. The visuals are explosive, though. It's interesting. At times, I'd go so far as to say intriguing. The show is rich in fascinating ideas, imagery and metaphors. I'm also sure I'd find it coming alive in a completely new way on a rewatch. 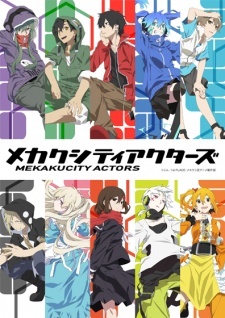 However from what I've read online, people who know other Kagerou Project iterations have also called this anime confusing and say that it's omitted important information. Imagine a pretty good story scrunched into a fragmented, messy ball of stylishness that leaves you colder than it should. There will be people for whom that's catnip, though.